If I wind back to just over 18 months ago, I was still to catch my first bass ‘by design’ in darkness on a lure – my how things have changed! Nowadays, I positively embrace those calm spells associated to the high-pressure systems. Moreover, a high percentage (around 70%) of my clients have wanted to experience what it is like to stand on a secluded beach under the stars waiting for that BANG through the rod! Despite some nice catches for clients (both in amounts and size) in daylight recently, you could most definitely say that I have become something of a night owl during the half-dozen sessions that I’ve conducted since the start of August. Yes, you read that correctly – I have fished only six times in the past two months! Completing my book here in addition to my guiding, alongside spending some quality time with my family during the summer holidays has restricted my outings to just a few hours primarily during late evening and into darkness. Below is a brief account of the catches I’ve achieved and how. You may recall how a number of clients caught some very nice bass (7-8lb) on one of my inadvertently ‘silver’ handmade needlefish courtesy of James Lanfear of Jim’s Lures here. Well, rather than attempt to peel the rather nice outer coating off of the beautifully crafted white needlefish (to reveal the silver foil finish underneath) I asked Jim if he wouldn’t mind producing some ‘bespoke’ silver patterns for me instead – which he very kindly did. ‘Things of beauty’ – the needlefish and the bass! 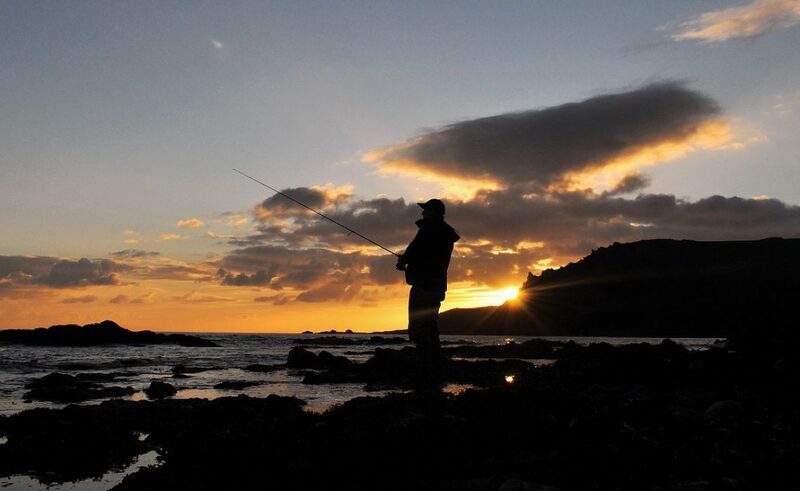 Armed with my new acquisitions I embarked on a session to one of the many shingle coves that I love to fish in darkness – the result, four bass in total with the two in the 3lb range all caught on my ‘new’ magic needlefish. Nothing big, but it’s always satisfying catching on a new lure. My next session occurred a week later on the 10th August. During dusk I concentrated on an area of submerged rocks jutting out in the tide and close to a prominent headland. Following this, and once it was dark, I fished under a spectacular moonlit and starlight sky whilst standing on the adjacent beach under the cliffs as the surf washed in over a large expanse of sand. ‘Invigorating’ doesn’t quite do the moment justice, and being able to stand on soft shingle casting a deadly needlefish out into the ‘surf-tables’ and water that was barely 2ft deep within such a setting is something I won’t forget – it was beautiful watching the waves break under the moon. One of five bass taken on the Seaspin Pro 120 – an expensive lure that casts well, is easy to ‘work’ and that catches bass. 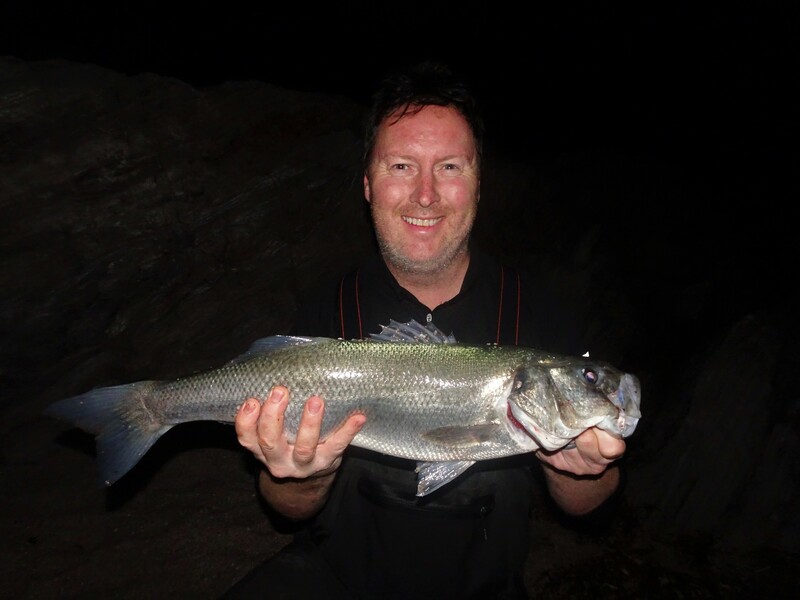 The fact that I managed to land eight bass (five small ones up to 2lb in daylight) on a surface lure that I really like (the Seaspin Pro 120 here) and then three larger bass in the 3-5½lb range in darkness was quite simply the icing on the cake! This one smashed the lure right in the undertow, taking line in the process. You can see it has spent most of its recent life over sand by its ‘lighter’ coloured back. What a lovely evening it was turning out to be, and the way the bass fought when hooked brought me additional pleasure. The first 3lb bass in darkness took the silver needlefish as it was slowly and horizontally descending through the shallow water, whereas the second bass hit it right in the undertow of the waves and really close to me. Despite its size, it managed to drag a couple of metres of line off the spool by using the sea’s energy (which had me briefly thinking I’d hooked into something really special!). Another light-backed bass and a bigger one to boot at over 5lb. Better still, the 62cm bass above nailed the needlefish after only a few turns of the handle and a good 50m out in the turning waves. As I inched it in (following the obligatory swim towards me) I scrambled to switch on my head-torch under the strain of the bass thumping its way along the sandy seabed, only to reveal it literally surfing the crest of a wave – what a sight! The silver bullet does it again! As an estimate, I would say that at least 8-9 bass out of 10 in the 3- 6lb range will be hooked on the centrally located treble hook as they sideswipe their prey. A few days later I managed to sneak in another late evening session – one that highlighted in spectacular style just how gluttonous bass can be. I lost count of the numbers of small (1lb) bass I landed during daylight from a small headland jutting out into the tide. However, it was once the light began to fade that the slightly larger ones came out on the prowl – with three in the 3lb range hitting one of my staple lures – the Daiwa Shoreline Shiner Z120F here. Subsequent to this onslaught, something occurred that wasn’t entirely unexpected – it went completely ‘dead’ once darkness set in as quite possibly, the bass were simply ‘stuffed’ on the baitfish that were clearly in the area and that had served to concentrate the bass shoals. I continued fishing from the same cove that I’d hooked the slightly larger bass within but after two hours without a single touch, I decided to call it a night – grudgingly so, as I knew I [probably wouldn’t get to fish for the next couple of weeks.